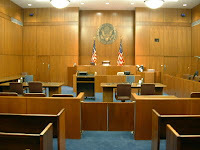 If you are a court interpreter like Judy, chances are you spend a lot of time inside courtrooms. So who's the most helpful person there if you are a court interpreter? The judge? The law clerk? The district attorney? Read on for Judy's take on this. If it's a big enough courthouse, these nice folks might be stationed at a variety of places. If it's a small courthouse, they do everything. They might save you the trouble of going through the metal detector if they know who you are, thus ensuring a longer life for your cream-colored briefcase (I have one). Tell you what's really going on in the judge's court, even if the judge insists her drug court is highly effective. 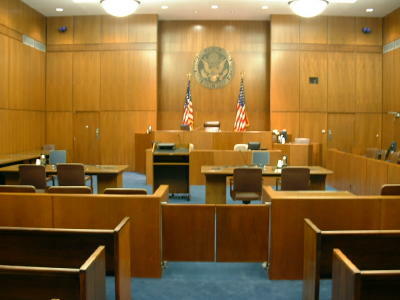 Ask the most helpful person in the courtroom how many defendants he or she has seen before and the number will be close to 100%. These folks have no political agenda. It's quite refreshing! Make you feel safe, no matter how intimidating the defendant in the orange jumpsuit. Really make you appreciate a man/woman in uniform. Who are these marvelous, hard-working, in-the-know, humble, discreet and sometimes flexible superstars of the courtroom? Meet the bailiffs/marshals (in Clark County, they recently unionized and went from being bailiffs to being marshals). There are a lot of wonderful people in the courthouse, but the marshals take the prize, hence this little ode to them. If you are beginning court interpreter, I suggest you make friends with these wonderful creatures. Next time, the donuts are on me! You had me going right up to the punchline! I like bailiffs, too, but I thought you were going to say the Court Reporter because he/she has Realtime (or whatever that heads-up display of words being transcribed is called) and tilts the screen up slightly so you can see it to sight translate from English when you're up on the witness stand! @Dan: Thanks for your insightful comment! You are right: court reporters are also absolutely lovely, and they are definitely second on the list of helpful professionals who make interpreters' lives easier. Greetings to Taiwan! Are you living there permanently? Hi Judy and Dagmar! Yes, I'm living here permanently. Currently teaching English in the military academy system (National Defense Medical Center--a West Point-type school whose grads become military medical professionals). Working on being able to be self-employed as a Spanish-to-English translator by summer 2015--wish me luck! Writing with the iPhone from the annual English Teachers Association Convention. Presenting on translation today. Wish me luck! @Dan: Oh, how exciting! That sounds like a fantastic adventure indeed. Keep us posted on it. And we did keep our fingers crossed for your presentation -- hope it went well!